This is one of my favorite shots of Market Square I’ve captured over the past couple years. It’s a Christmas time panoramic shot featuring a wonderfully wide angle view of Market Street, Daniel Street, a glimpse of the Christmas Tree and of course, Breaking New Grounds. The sunset this afternoon was just incredible with rich orange tones just reaching over the rooftops of the Congress Street buildings to illuminate the Alie Jewelers building and the Market Street rowhouses in the distance. You can even see a little tiny bird flying just above the Market Street roadway in the upper left area. This one will look gorgeous large-scale, and I plan to make some cool huge prints out of it for my house or office. Hope you enjoy! Today’s post features the focal point of Portsmouth (on land anyway…). Market Square is probably the busiest area by square foot in all of the city….with outdoor cafes, window shoppers, outdoor benches, not to mention a pretty ridiculous intersection with cars coming from Daniel Street, Pleasant Street and Market Street. 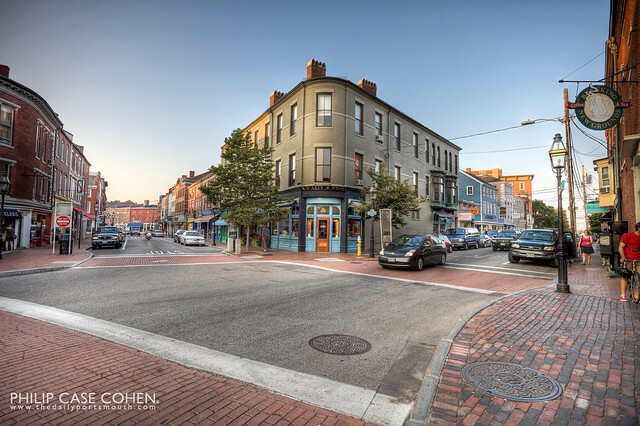 I wanted to feature this vibrant spot with people going about their business, walking, driving, browsing…and also wanted to show what this hopping place looked like back in the day of horse & buggy carriages. Fortunately I was able to locate this shot below. You can clearly make out the Athenaeum, the Alie Jewelers building, the Market Square Jewelers building…the Daniel Street intersection, and of course Market Street itself. I plan to have a few more of these Then & Now posts for everyone to enjoy. The modern day Market Square shot was a 3-exposure composition….with a fair amount of movement between the three shots. The software that I use for the exposure blending (Photomatix) now has a feature that lets you select areas of movement – so that you can pick the best image and freeze the motion to the one frame. It makes for a beautiful shot and a more realistic appearance. Hope you enjoy! 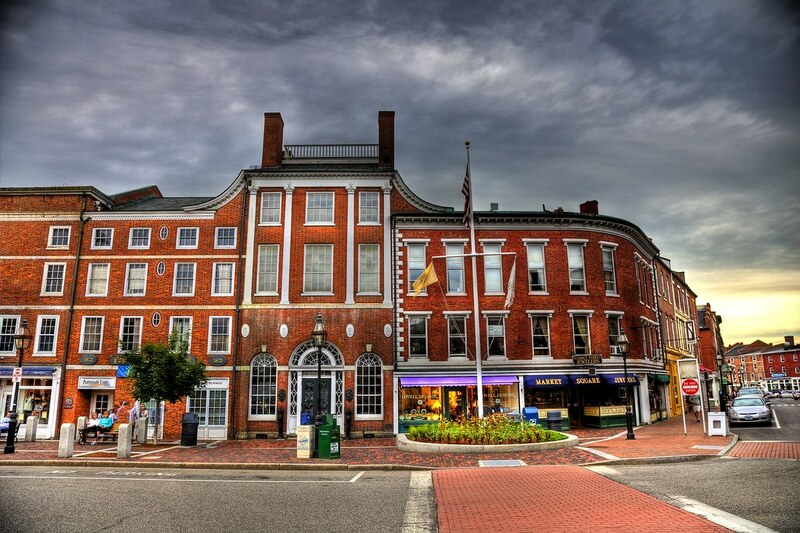 Today features one of my favorite shots of the Portsmouth Athenaeum. 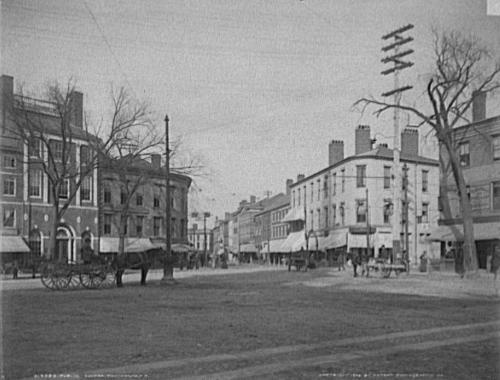 This shot of Market Square was taken just in front of Breaking New Grounds at the corners of Market Street and Congress Street. Go visit the building sometime on a Thursday afternoon – it’s easily one of the coolest places in town, when you walk in you can simply feel the seacoast history in the room. The reading room is just inside the large rounded doorframe, and you instantly feel as though you’re back in the 1700s or so, with gigantic paintings of historic figures adorning the wall and cool flooring & carpentry throughout. I hope to do an indoor shoot in the near future and share some of the beauty with all the readers here!